October 12, 2017 – While engineers in Europe continue to outfit the Orion spacecraft’s service module for Exploration Mission-1 in preparation for shipment to NASA’s Kennedy Space Center in Florida next year, work is already beginning on the service module that will power, propel, cool and provide air and water for the first crewed mission in the Orion spacecraft in the early 2020s. 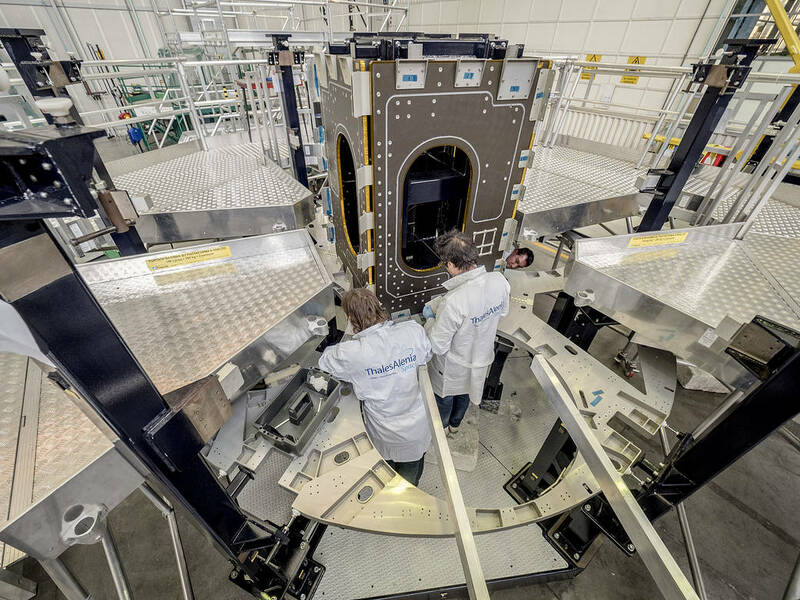 Technicians at Thales Alenia in Turin, Italy, are working on the primary structure of the European Service Module that will carry astronauts in Orion beyond the Moon during Exploration Mission-2. ESA (European Space Agency) and its contractors are providing Orion’s service module for its first two missions atop the Space Launch System rocket. NASA is leading the next steps in human space exploration and will send astronauts to the vicinity of the Moon to build and test the systems needed for challenging missions to deep space destinations including Mars. NASA is working with domestic and international partners to solve the great challenges of deep space exploration. The 13-ton service module will provide propulsion, power, temperature control and air and water for future crew members aboard Orion.